HUGE update today - mostly of course about MegaCon! All the details (both in the "about" section and the "discussion" section about MegaCon can be found on my MegaCon Event Page here. Or scroll down below in this update for more info =) MegaCon Orlando is May 24, 25, 26 & 27th and I will be there with thousands of pieces of artwork in my giant 30 foot Exhibitors Booth. We have hundreds of free MegaCon Exclusive pins, free reusable Strangeling shopping bags, free Strangeling bamboo fans & other convention swag for you! (And Patreon Patrons can always pick out a free 4x6 print in person!). Again, details are here or scroll down for more. Secondly - we've begun broadcasting regularly live from my studio a couple times a week on TWITCH here! You can catch up on our episodes so far here , and my next live broadcast will be this Friday, May 25 at 7PM Eastern Time (midnight UK time). It's free! Come by & chat, ask questions about artwork, whatever you want, it's easy & relaxing. This month I've been working mostly on original paintings that will debut at my "Magical Thinking" solo show at the Corey Helford Gallery in Los Angles - I'll be there in person for the opening this July 28 and the show will hang for a month - we'll be having a huge opening party that night and everybody is welcome - details here. 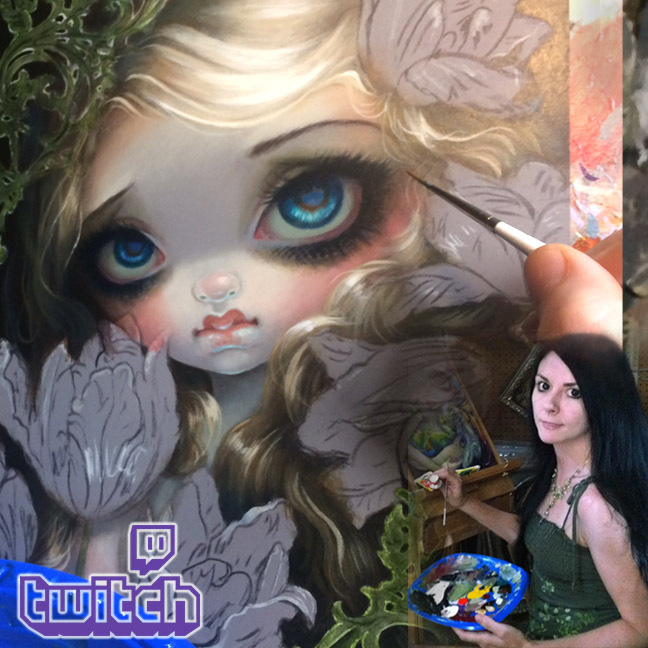 You can watch me paint all of the paintings for the show on my Twitch videos here , with finished previews shown up at my Patreon. It's time for MegaCon! All the details (both in the "about" section and the "discussion" section about MegaCon can be found on my MegaCon Event Page here. MegaCon is a huge "mega convention" - anime, sci-fi, fantasy, comics, gaming and more. It is at the Orange County Convention Center (fabulous location - by Disney, Universal, etc. if you want to make a weekend of it). Jasmine is am NOT in the "artist alley" - she is an Exhibitor in the large part of the room and will have TONS of artwork, merchandise, collectible enamel pins (including the new MegaCon Exlusives, original paintings, books, oracle cards, open edition canvases, mini prints, Canvas Cuties, coloring books, paper prints, tarot cards, jewelry, figurines & more. Again, Matt, Chris and Amber will be running the booth and Jasmine will be in attendance in person each day for specific scheduled times for autographing - times posted above. Her artwork will be available for purchase all day for all four days of the event. We will have three Exclusive Strangeling Pins at MegaCon 2018. "Venus" "Earth Angel" and "Orange Blossoms" (a collaboration with myself and fellow Florida artist Carrie Hawks, she is at booth #8FA also on the floorplan above, we both have "Orange Blossoms" pins on Friday). Come EARLY to be there when the show opens if you'd like to get a free pin with your purchase (while supplies last). Any purchase, even a $3 postcard will get you a free pin. 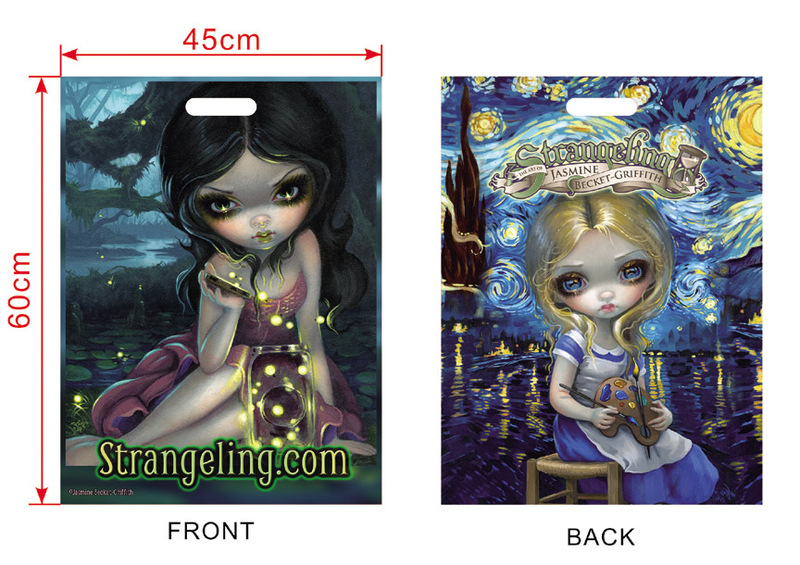 We'll also have lots of pins for sale, and if you buy a couple you'll get a free Strangeling Lanyard! Giveaways start the second that MegaCon opens its doors! Bamboo Fans! 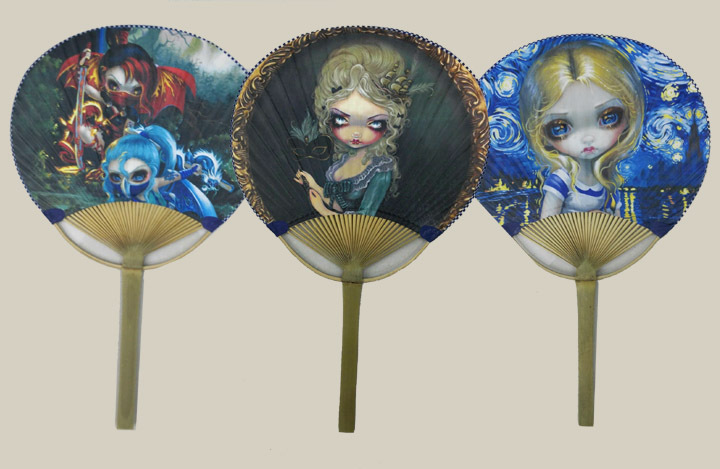 I have had some bamboo paddle-style fans (great for if it's hot & crowded!) featuring my artwork! We'll have some available as giveaways free with purchases $20 or more (or you can buy one directly for $5). With purchase (usually $10+ I think) you'll get a free Strangeling Shopping Bag - a brand new design I've had made just for MegaCon! Environmentally friendly, woven synthetic fabric, sewn/stitched, re-usable bags - these are BIG 24" bags! The Megaon Exclusives & Giveaway items are NOT for sale and cannot be reserved, please do not ask. That being said - we are setting aside any leftover pins/bags/etc. from MegaCon and will be sending them randomly to our Patreon Patrons all over the world - everybody with a valid Patreon account at my Patreon page here may be included in the random surprise shipments. 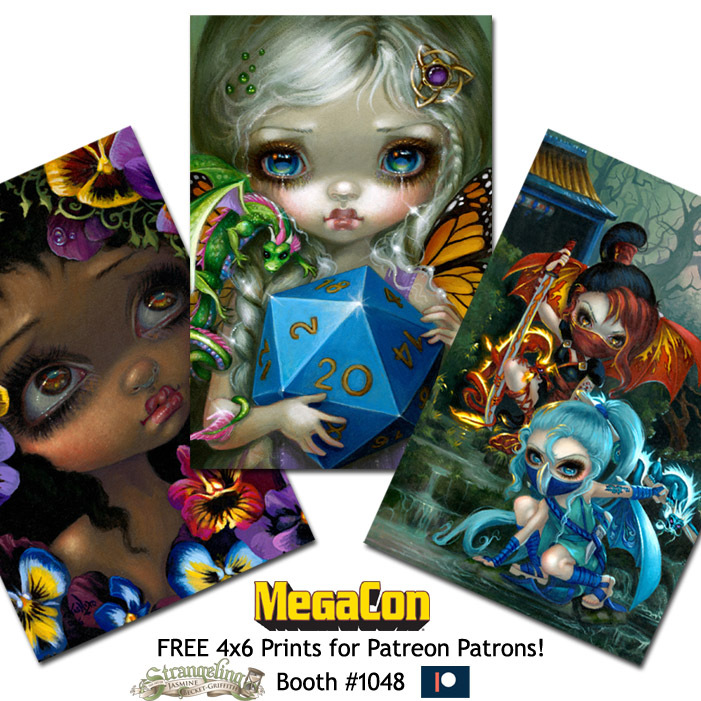 Yes, all of my Patreon Patrons attending MegaCon can drop by my booth (booth #1048) at any time throughout the event to choose your very own FREE 4x6" mini print! We have thousands to choose from =) Just let us (Amber, Chris, Matt or me - whomever is there manning the booth) know what name your Patreon account is registered under and you can pick out a 4x6" print - absolutely free. Bring it by during any of my autographing sessions and I'll sign it for ya for free too. If you are not yet a Patreon Patron but are attending MegaCon - I recommend signing up for Patreon before you go - just click the orange "Become a Patron" button here at my page. All tiers are included, so basically even if you just join for $1 you can get a free print at the show (and yes, you could then just quit Patreon right after MegaCon, lol, but I recommend sticking around because Patreon is awesome). We have several brand new pins! The April Pin of the Month - "Clockwork Dragonling" and the May Pin of the Month - "Skulls and Stars" are now available to the public for sale here! Each is $12.99 and we are happy to ship worldwide. What a little cutie! And many more to come - you can see all the Strangeling Pins so far here . I've got a ton of new Patreon-Only Coloring Pages available to download including a bonus "Orange Blossoms" (with Carrie Hawks / Tigerpixie ) and "The Moon" coloring pages just released!